A common misconception in education is that a brand is simply what you see, like a logo or a website’s visual design. In fact, your school’s online brand is the digital manifestation of its reputation — what current and potential students think; what staff and faculty believe the school is about. The visual aspects of your logo or website are, indeed, an important first impression. But first impressions aren’t enough to keep students and parents interested in your school. 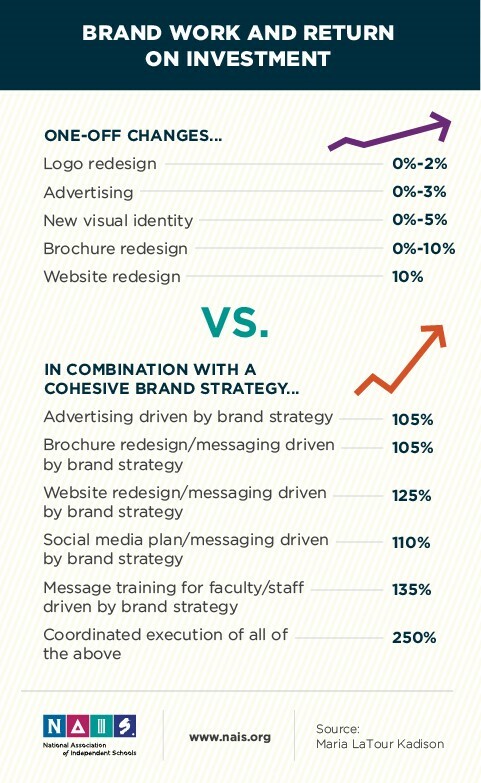 If you want to earn an “A+” in recruitment and retention, you need a brand strategy. It’s an uncertain year. Declines in enrollment are top of mind for all school administrators. Help insulate your school from these issues by improving your brand, especially online. The reason for weak branding messages usually isn't incompetent marketers. Rather, the school itself -- its president, board, key administrators, and faculty -- have never defined a mission and accompanying strategy that clearly sets the school apart from other schools. A website redesign, alone, can garner a 10% return on investment A thoughtful brand strategy applied to a redesign can bump that ROI to 125%! So don’t just think about a makeover. Instead, set goals beyond refreshing the site look-and-feel. It all starts with defining goals that will support your school's mission. But not just any goals; goals that can be measured. Then define specific actions to reach those goals. Strengthening the ties between measureable goals and action is the key to an successful brand strategy. With an established plan, resources like branding guidelines help you connect brand promises with concrete action. Our client Family Friend Poems uses their brand guidelines to help new staff understand the organization’s mission, goals and message. For example, if your school is a leader in STEAM, you want to attract students who are excited about applied physics. That’s a goal that directly ties to your mission. Perhaps your website should include videos of in-classroom experiments to show prospective students the hands-on learning they will get. That’s the action. And these videos can be shared on social media. That’s the measurement. When you have a solid message (coupled with a plan of action), your branding goals evolve past ideas and into reality. And messaging isn’t just words. It’s everything about how you portray your school; what is uniquely you. Go through a thorough process of identifying what, specifically, your school does best. Is it your focus on a specific type of academics? One-on-one coaching? Extra-curricular activities that help the community? When people think of your school, what do you want the first thing to come to mind? The answer is the core of your message that will influence everything from look-and-feel to copy to how you communicate with parents and students. 60% of US millennials expect consistency when dealing with brands online, in-store or by phone. Once you’ve narrowed down the core of your message, make sure that one platform doesn’t deviate from the other — that includes online and offline. Your online newsletter and social media profiles should visually mirror your website look-and-feel. The content and tone of voice in your copy should be similar, regardless if it’s a printed course catalogue or a fundraising email. FamZoo’s consistent identity — online and offline — reinforces their financial services as an established brand families can trust. In a world of information overload, consistency reinforces your school’s identity and keeps students focused on the value your school adds to their lives. Students aren’t just recruitment numbers: they have hopes and dreams of improving their futures. The education you provide is personal. You need to make your brand strategy personal. Make sure students understand why they’re going to your school specifically. Tailor every touchpoint — website, social media and brochures; copy and look-and-feel — as an ongoing conversation about their personal experiences, goals and even challenges. This helps connect your school brand with students’ identities, increasing the likelihood of them attending and staying. Bolster your school’s reputation by going beyond the visual surface! Investing in a complete brand strategy that relies on consistent, personal messaging will attract and keep students attending your school. Ready to increase student applications and lower attrition? Let’s build a brand strategy for your school! Schedule a FREE 30 minute consultation today!